Invisalign® aligners are an alternative to metal braces for straightening your teeth. Here, our Mount Pearl dentists talk about the differences between these two orthodontic treatment options. 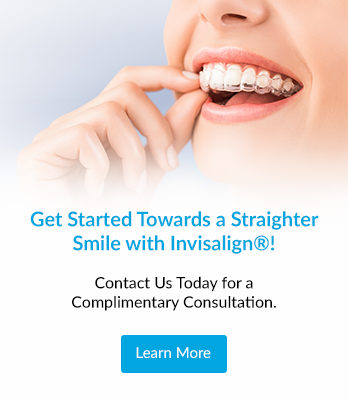 Invisalign®'s series of clear, removable plastic aligners that can straighten your teeth without metal or wires. During Invisalign® treatment, you'll wear each set of aligners for a period of ten days to two weeks. After this time, it will be switched out for the next set. When worn, Invisalign®'s transparent plastic aligners are difficult to see, meaning that very often, the people around you won't even notice you're undergoing orthodontic treatment. This makes Invisalign® a good choice if you have concerns about the aesthetics of traditional metal braces. Invisalign® aligners are also removable, which mean they require no significant changes to your diet or to your at-home oral hygiene routine. Metal braces are made up of small metal components that your dentist will manipulate to guide your teeth and/or bite into a new, corrected position. The three primary parts of traditional metal braces are the brackets, the wires, and the elastic bands. These elements work together to apply specifically calibrated forces to your teeth, slowing moving them over time. Metal braces are effective for both simple and complex misalignment cases. In recent years, improvements to their size, design and comfort mean that braces are fair less obtrusive and disruptive to day-to-day life than they once were. If you have more questions about Invisalign® or braces, please contact our Mount Pearl dentists today to book a consultation.